Trump spoke hours after signing a short-term spending bill that covers key government departments for two more weeks, until Dec. 21, setting up a pre-Christmas showdown over the wall. The president wants the next spending package to include at least $5 billion for the proposed wall. House Democratic leader Nancy Pelosi of California rejected that a day earlier. At an appearance in Kansas City, Missouri, Trump accused Democrats of playing a political game, and said it was one that he ultimately would win. He also said money for a program that encourages federal, state and local authorities to collaborate on crime-fighting strategies was increased by $50 million this year. The president said he will ask Congress for more money next year, but didn’t say how much. Trump said his administration is giving law enforcement officials the resources they need to do their jobs. He said there are more than 200 new violent crime prosecutors nationwide and cities have access to $600 million worth of surplus military equipment. Introducing Trump was acting Attorney General Matthew Whitaker. 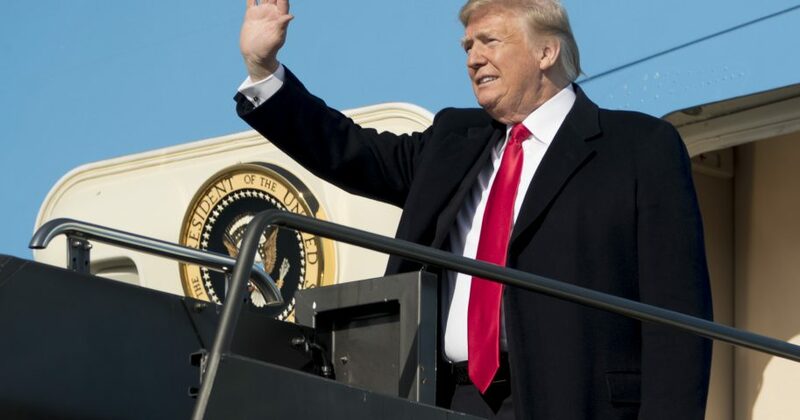 Trump announced before leaving Washington that he planned to nominate William Barr, who was attorney general under President George H.W. Bush, to again lead the Justice Department. The short-term spending bill avoided a partisan fight that had been expected this week as Washington. It was put on hold for ceremonies honoring Bush, who died Nov. 30. Trump is set to meet Tuesday at the White House with Pelosi and Senate Democratic leader Chuck Schumer of New York. Republicans control the House and Senate now, but Democrats will retake the majority in the House in January after midterm election victories last month. Trump has been agitated by multiple caravans of Central American migrants that have made their way to the U.S.-Mexico border. Several times he has threatened to seal off entry into the U.S. He claims many of the migrants are criminals or individuals unwanted in the U.S.
“Every American citizen is entitled to a safe community and a secure border,” Trump said. Associated Press writers Zeke Miller and Deb Riechmann in Washington contributed to this report.